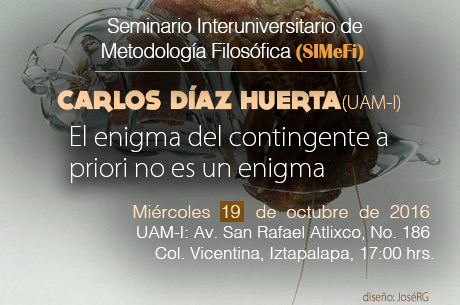 Bajo los auspicios del Instituto de Investigaciones Filosóficas de la UNAM, en el semestre septiembre-diciembre 2016 se reanudará el Seminario Interuniversitario de Metodología Filosófica (SIMeFi). El SIMeFi, que se dirige a investigadores y estudiantes de posgrado en filosofía del Distrito Federal, se reunirá mensualmente en la institución de pertenencia del ponente. En cada sesión, el ponente podrá presentar o bien un trabajo original propio, o un análisis crítico de algún tema. Las sesiones serán de dos horas (una hora de presentación + una hora de discusión). 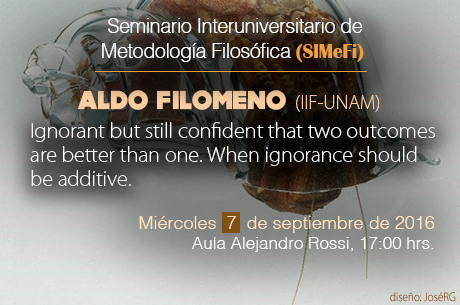 Aula Alejandro Rossi - IIFs, 17:00 a 19:00 hrs. Ignorant but still confident that two outcomes are better than one. When ignorance should be additive. Across the history of philosophy we find arguments dealing with certain issues whose truth-value we completely ignore. A classic representation of our epistemic state of ignorance – from objective bayesians – is to assign the same degree of belief to each possibility. Others, instead, are critical of this representation for a number of reasons, and advocate for suspension of judgement. Which is the correct representation of ignorance bears on the soundness of certain important arguments in the history of philosophy. In this talk I survey both positions with an example. Then I will propose that there is not a unique best representation of our doxastic attitudes simpliciter. Instead, the choice of the appropriate representation is relative. The validity of both accounts suggests that in the meta-epistemological discussions about the appropriate representational frameworks of our doxastic attitudes, pluralism is the correct view. 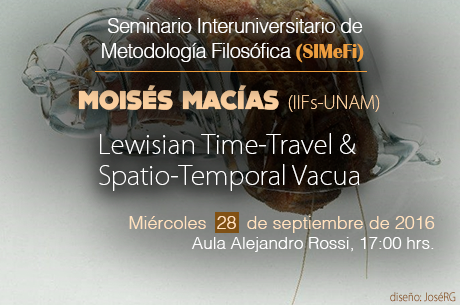 Lewisian Time-Travel & Spatio-Temporal Vacua. Av. San Rafael Atlixco No. 186, Col. Vicentina, Delegación Iztapalapa, 09340, CDMX. El enigma del contingente a priori no es un enigma. 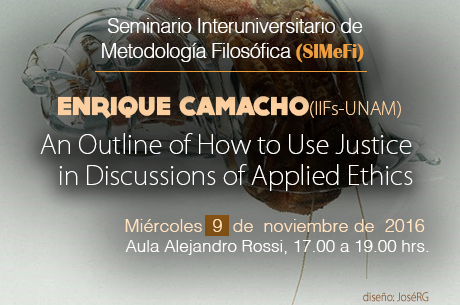 An Outline of How to Use Justice in Discussions of Applied Ethics.